Forever 21 Back to Uni Haul! There’s just something about being 21 that makes you feel young, wild, and so free. They say being 21 is like finally wearing that dress you’ve always wanted to fit in or sky diving without your parents knowing. Nonetheless, it’s your prime time. Forever 21 has always been one of those stores I almost never come out empty handed and when I feel like shopping, I’ll shop. When I don’t, I won’t even if you forced me too. Just like you eat when you’re hungry, I’ll only shop when I feel like it. And well, this time, I felt it. The occasion? It’ll be my last semester of uni so I needed a few new outfits. Plus, they were having a sale so I thought, why not? My wallet isn’t much happier but I am! 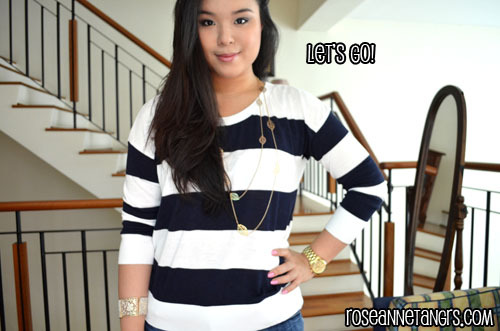 Here are some clothes good for fall, or layering and some accessories! 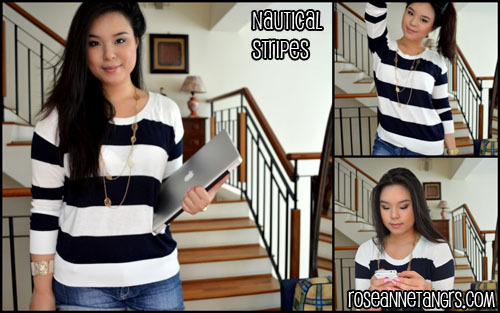 The first outfit is inspired by the nautical theme of blue and white stripes. I am a mega fan of this pattern. Although they say horizontal stripes make you appear wider and vertical stripes make you appear taller, why in the world would you wear vertical stripes. I say vertical stripes unless super skinny and not that noticeable, are for your pjs. So despite appearing a little larger, I still like this laid back whatever sweater I can just throw on and head to class with. I also love my new gold leaf necklace (I’ve been wearing it aplenty these days) and it just elongates the look. Knit tops are always hot during fall and winter. This one is a bit transparent so you might want to wear a tank under neath it, but I love the combination of pastel green and pink. I love big knit sweaters thrown over anything. They’re some comfortable and pairing it with a beaded necklace can really help it make the look a little classier and garden tea party ish! 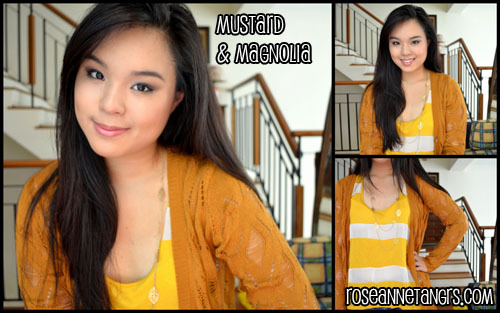 I’ve been watching the Style channel loads and they say that magnolia is the new color of the season – or just really a mustard yellow. So I thought why not pair a knit with yellow and become all mustardy. Well, the combination kind of works I reckon. It’s laid back style I really want to sport this season. None of that high maintenance stuff, I just want to chill, have fun and have clothes that let me do whatever I want. One of the last tops I got was really for Singapore weather. I’m really into throwing tops on and getting out of the house with some jeans shorts and flip flops on the weekend. At work, I’m in my heels and working girl clothes so on the weekends, I like to just kick back and wear whatever I want. 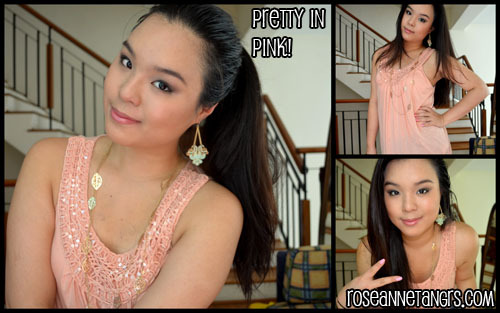 I love the color – it’s super girly and the detailing isn’t too bold as well. The mint green earrings also from F21 compliment the whole look. It’s classy but comfortable. I also got a cuff, possibly my first cuff. 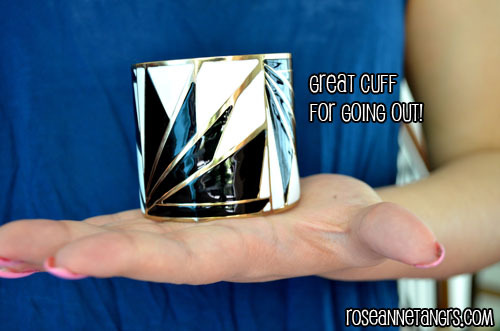 It’s a black and white and gold fan and striped cuff (that’s a lot of adjectives!) that’s fun for going out to a party or for nights out with your girlfriends. I wore it last friday and it looked awesome with my skirt and top. Clubbing isn’t too formal in Singapore! So there we have it! My F21 haul for back to uni (or even school). Quick Beauty Tip: Where do I put my eye-shadow? Love you outfits! Especially the first! 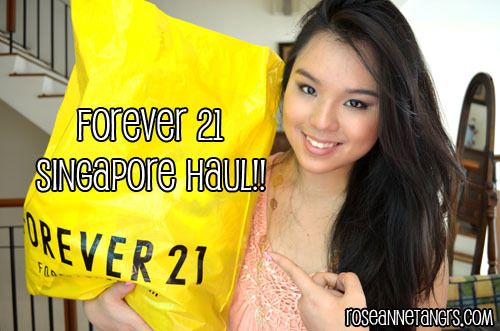 Is there a forever 21 shop in Melbourne?Or did you buy them in Singapore?